Can it Really be Fall? Naisbitt-Bagley Team Real Estate Newsletter! Can It Really Be Fall ? Naisbitt-Bagley Team Real Estate Newsletter! I certainly feel fall in the air! BE SURE TO WINTERIZE! FREEZING TEMPERATURES HAVE ARRIVED! 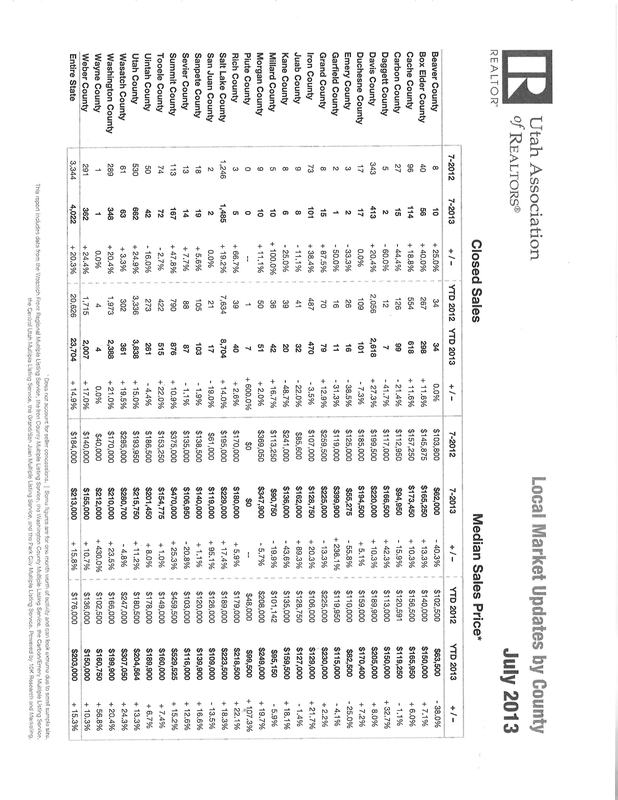 The Utah Association of REALTORS (UAR) Local Market Updates by County for July 2013 have arrived. Since it takes UAR a couple of months to compile the statistics from all of the county board offices, these are the latest available today. This Report shows the closed sales and Median Price for all counties. The IronCounty closed sales were up 38.4% in July this year versus July 2012. However, if we look year to date (YTD) as of July 2013 as compared to July 2012, the closed sales are down 3.5%. The Median Sales Price is up 21.7% YTD to $129,000 as compared to $106,000 YTD as of 2012. Homes in CedarCity and surrounding areas are still selling quickly if priced correctly especially in the ranges up to $150,000. We are seeing multiple offers. It is actually a sellers’ market in some price ranges in my opinion. Homes above $200,000 are also selling when priced correctly and also sometimes attract more than one buyer. Many homes are still priced as bargains and are competing with foreclosures and short sales. However, the buyers are also competing to purchase those bargain-priced homes. There has been a reduction in inventory in homes especially up to $150,000. We are seeing new construction, and it is indeed attracting buyers. Presold new construction homes are still difficult to sell. It is better to build the home to attract the buyers. A few Land parcels and lots are sold but are still behind the already built homes. Development land and commercial are slow sales. We are seeing investors in the market picking up rental homes and fixing up and flipping to make a profit. Buyers purchasing their own primary residences are still in the lead, but 2nd home buyers have returned often with cash. We are seeing sellers who have had foreclosures and short sales in the past, qualifying now to purchase homes. There is now a possibility that some buyers who have had short sales and foreclosures may qualify to purchase a home after 1 year if there was a good reason for the default. This is an FHA program. Interest rates are still great even though they have risen a bit. Aggressive marketing is required to sell a home or property in this market and it must show well and be priced right. If an offer hasn’t come in within 30 days, call the Naisbitt-Bagley Team to receive updated information and consider a market reduction in price. If the home is not priced correctly, it will not attract showings in spite of the aggressive marketing we are doing. Please remember the way you show a home and the way most people live in a home are 2 different things. Please call for a staging consultation to make sure your property is shown to the best advantage to attract the buyer to make an offer. As far as I know, there is no one marketing more aggressively than the Naisbitt-Bagley Team with global on-line marketing with featured ads, banner ads, blogging, enhancements, magazine ads, TV, radio, and much more. The Team pays the Chamber to send Team ads to everyone that contacts the Chamber. Since many of the buyers in our area are out of state, the Naisbitt-Bagley Team targets out of state buyers, in state buyers, as well as REALTORS. Janet may not be the one that sells the home, but her marketing will be the reason it sells. Contact the Naisbitt-Bagley Team today at 435-865-1019 or text 435-559-7772. You can also email naisbitt@inxsnet.com. Check out the inventory at www.findhomesincedarcityut.com or www.homesincedarcity.com. Our experienced and knowledgeable Team will work hard and give top service with top technology to help you make your real estate goals a successful reality! To Buy or Build Your Home? That is the ? I am currently working with a buyer who has had her dream of a home in her head for many years. It even has a room for her garden, a room for her cats and a storage room for preparedness. She can afford to build. What is stopping her? She has found an absolutely gorgeous home in the perfect location that feels like home. Does it have all her dreams? It does not. However, it feels so right that she didn’t even want to leave after I showed her the home. In fact, she delayed her trio home to California just so she could see it again just on the outside. What should she do? If you have any input, please let me know and I will pass the suggestions onto her. She is losing sleep, so any help she can get would be appreciated. Is it easier to add rooms, shelves and a wall to an existing home she loves or is it easier to build the dream? Wow! I am happy this is not my decision! I actually gave up on building my dream home many years ago. I love swimming. My dream home even included a swimming pool in the middle with a balcony above to dive into the pool. I don’t know the answer to this question. Do you? I honestly believe she will be happy no matter which she decides to do. To Build or To Buy? Whether you build or buy, now is a good time to contact the Naisbitt-Bagley Team at ERA Realty Center at 435-864-1019 to help you make your choice. What a fun choice! Check out the lots, acreage, homes for sale and new construction at http://www.findhomesincedarcityut.com or http://www.homesincedarcity.com for bargain-priced homes including foreclosures and short sales. The Sun has Set On Our Happy Labor Day! Or should I have said, “The sun is setting on our happy non-labor day?” This is the holiday that offers a day of rest from our working life, and it has been a fun one! I spent time at the Iron County Fair enjoying friends, family, food, entertainment, purchases at the booths, and talented entries at the fair. It has been a fabulous day! Did you work, too? I do have to admit that I did spend some time on real estate. I love my career, and I am grateful for clients who need my help with their real estate goals even on Labor Day! Please let me know what I can do in order to give you top service with all of your real estate goals! I would love to have our Naisbitt-Bagley Team experience and knowledge benefit you! Please call today 435-865-1019 or email naisbitt@inxsnet.com at ERA Realty Center. Going Up? That is Where Real Estate Home Prices Seem To Be Traveling! Buyers beware of rising home prices. Recently, we prepared a Broker Price Opinion for a seller. It was accurate at the time. Now the value has already gone up in my opinion. Why do I believe this is so? A similar home just went under contract for more in the same neighborhood.